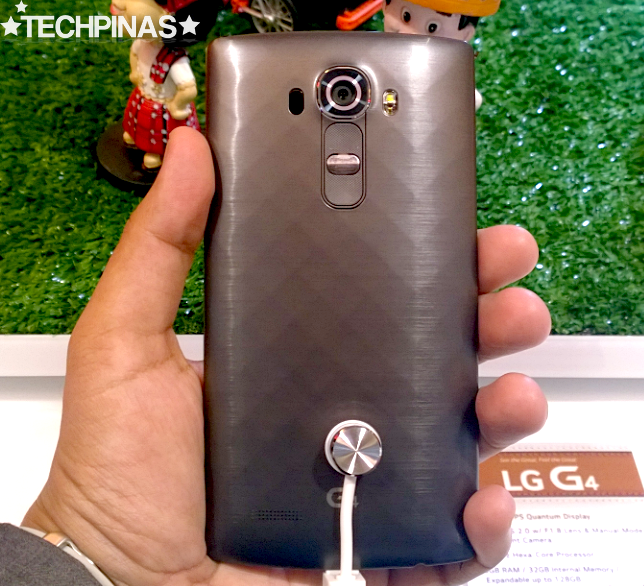 LG G4, the Korean electronics company's 2015 flagship smartphone, has been available for pre-order in the Philippines since May 16, 2015 but it was only last Thursday - May 28 - that LG officially introduced it to bloggers and members of the media via an exclusive event held at the Main Theatre of Solaire Resort and Casino in Entertainment City Manila. 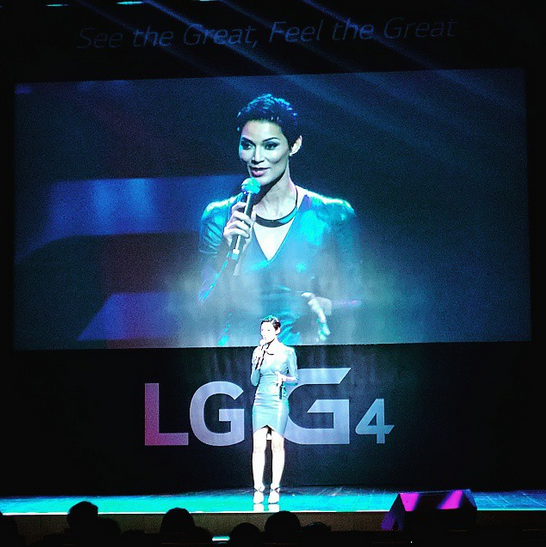 During the event, our friends from LG Electronics talked about the key features and capabilities of the LG G4 and likewise introduced the celebrities and personalities endorsing the device. 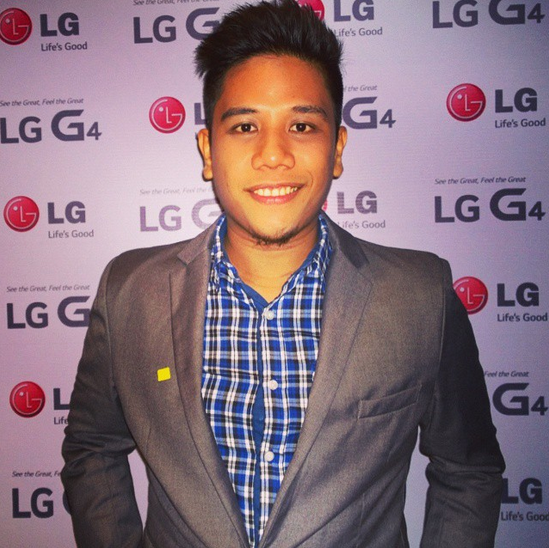 Mr. Jay Won - LG Mobile Philippines Vice President - shared, "From the design to the camera to the display to the user experience, the LG G4 is undoubtedly the most ambitious phone LG has ever created, promising world-class performance and no disappointment." As a top-of-the-line release, LG G4 represents the very best design elements, imaging capabilities, and user interface enhancements that the Korean technology giant could have given a smartphone thus far. Later, I'll talk about the handset's key features and main selling point in detail. 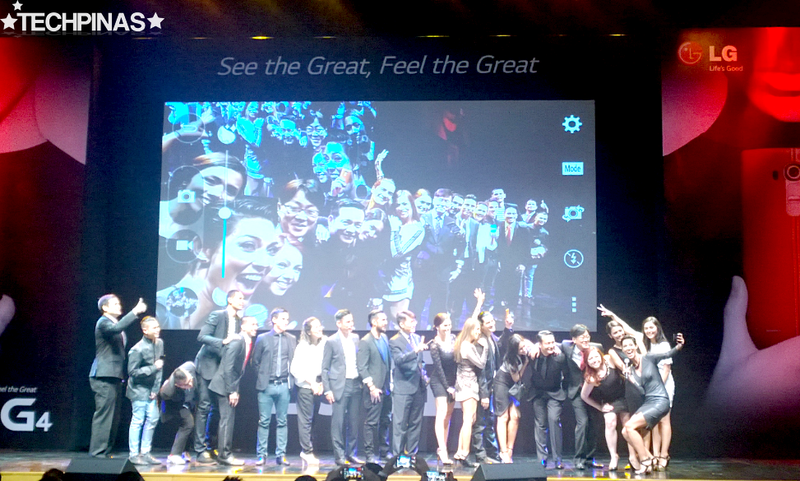 LG G4 endorsers posting for a groufie taken using the phone's 8 MegaPixel front facing cam. Genuine Leather feels great to touch. 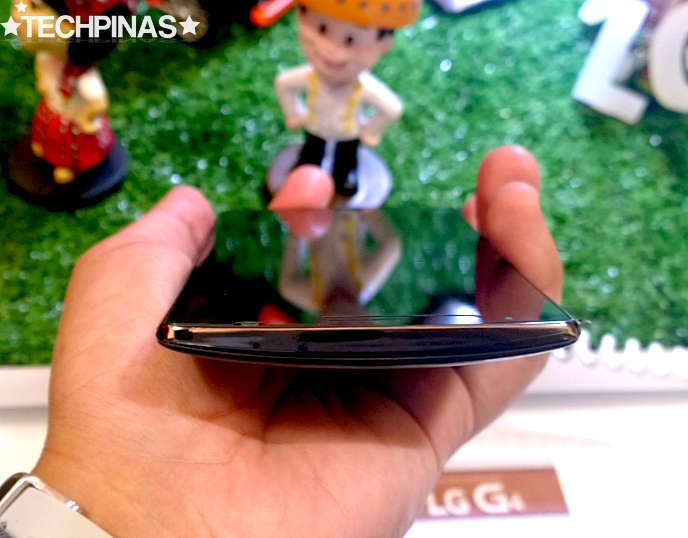 As explained wonderfully by Miss Faith Mijares - Product Marketing Manager of LG Mobile Philippines - during the launch, one of the defining or distinguishing design characteristics of the LG G4 is its eye-catching back cover, which is available in two finishes. First, we have the handcrafted, vegetable-tanned, full-grain leather in three attractive colors, which is not only environmentally-friendly but also luxurious. 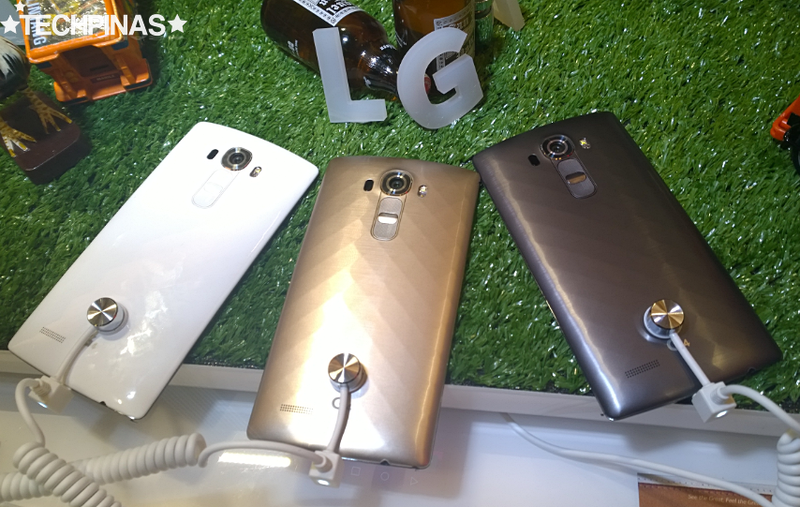 And second, there's the LG G4 with the equally eye-catching polycarbonate back covers that are available in Ceramic White with 3D patterns, artisan-forged Black Titan and lustrous Shiny Gold. LG G4 flaunts a 5.5-inch Quad HD IPS Quantum display, which is thinner than your regular IPS panels and delivers more vivid colors and more crisp details. 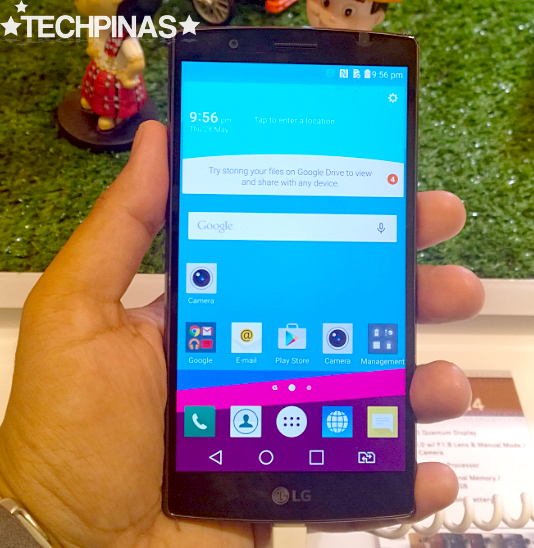 This is another defining feature of the LG G4, setting it apart from other high-end offerings of the brand. 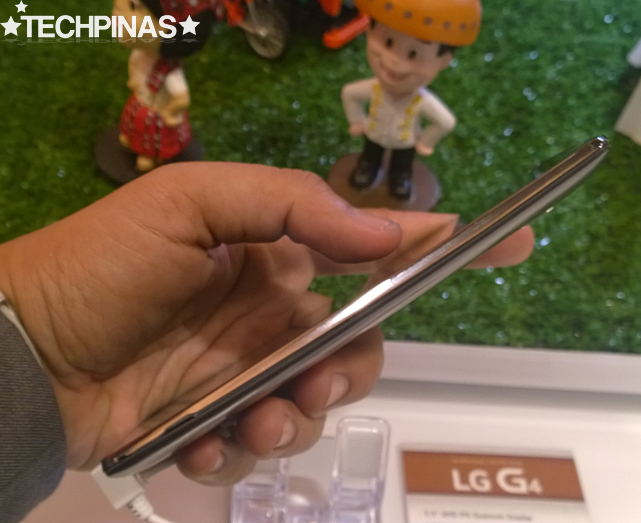 LG G4's face or screen is ever so slightly curved inwards. In fact, the curvature is so little that I doubt if too many consumers would even notice it. The G4’s design is defined by - what the company calls - Slim Arc, which runs along its entire body, highlighted by the display's subtle curvature. 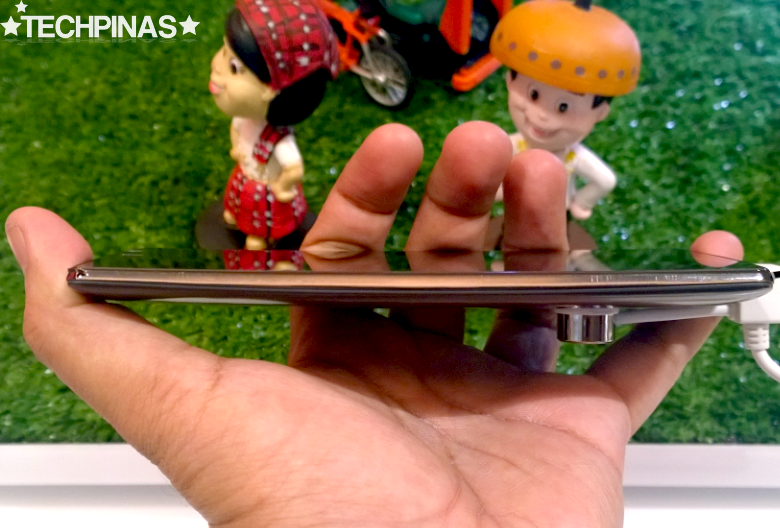 According to LG, "More than just a design accent, Slim Arc offers more durability than a flat smartphone in face-down drops and gives the smartphone a more comfortable and secure feel in the hand." 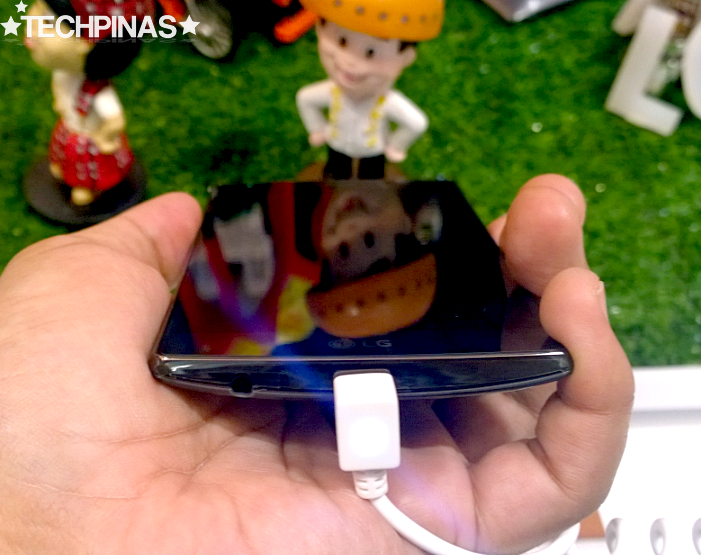 This design language is based largely on the extremely attractive 'Floating Arc' look of the 2014 TechPinas Badge of Excellence Awardee, LG G3. 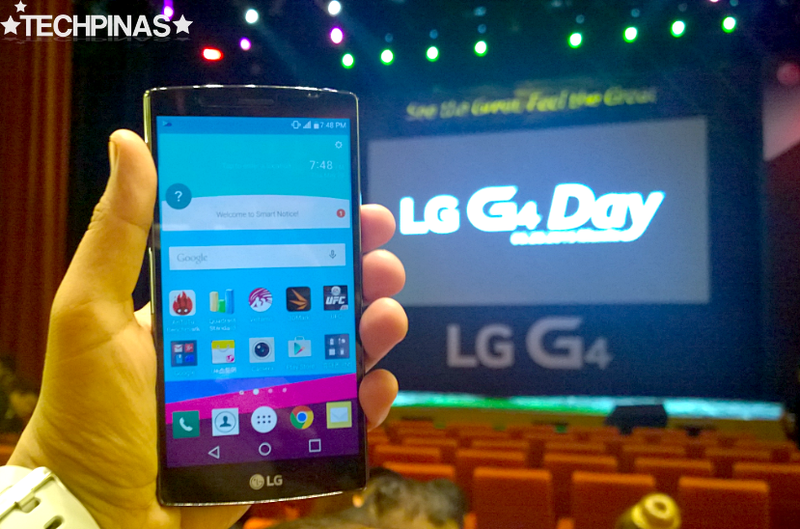 LG is particularly proud about the top-notch imaging capabilities that they have given the G4. The 16 MegaPixel camera at the back has a f/1.8 aperture which lets in up to 80% more light than other competing smartphones in its price echelon. Paired with a large image sensor, optical image stabilization, and manual control mode, such aperture allows the handset's main cam to deliver brilliant shots with great detail even in low light settings. LG G4 sports the latest version of the company's signature RearKey at the back, which combines the volume rocker and the power button in the convenient spot where your index finger usually rests when holding the phone. Above that, you will find the camera module flanked by the laser focus sensor on the left and the LED flash plus the color spectrum sensor for perfect white balance on the right. As for the handset's internal hardware specifications, the LG G4 runs its UX-skinned Android 5.1 Lollipop operating system with a Hexa Core Qualcomm Snapdragon 808 chipset, handles multitasking with 3GB of RAM, and has 32 GB of expandable storage. This flagship model is powered by a 3,000 mAh Li-Ion battery pack, which LG made removable -- 'as requested by consumers', the company said. 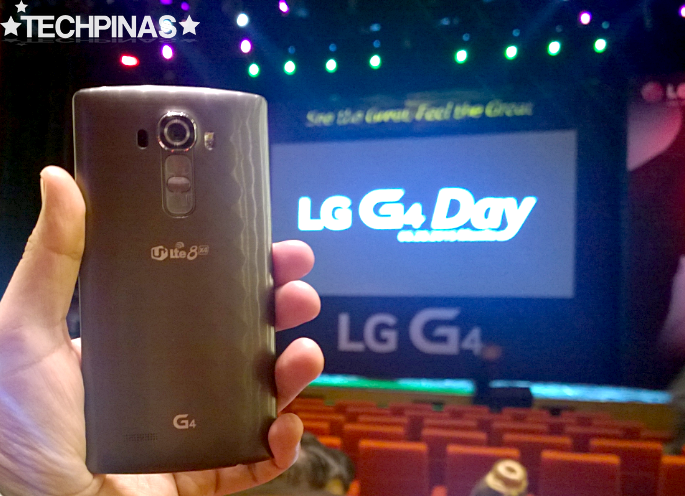 Check out more photos that I took from the LG G4 Philippine Launch event entitled "See the Great, Feel the Great". 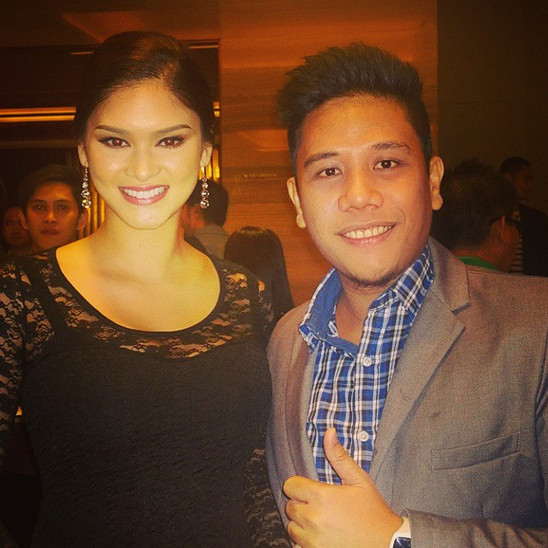 The handset introduction and the whole programme was hosted by Asia's Next Top Model mentor, Miss Joey Mead-King. 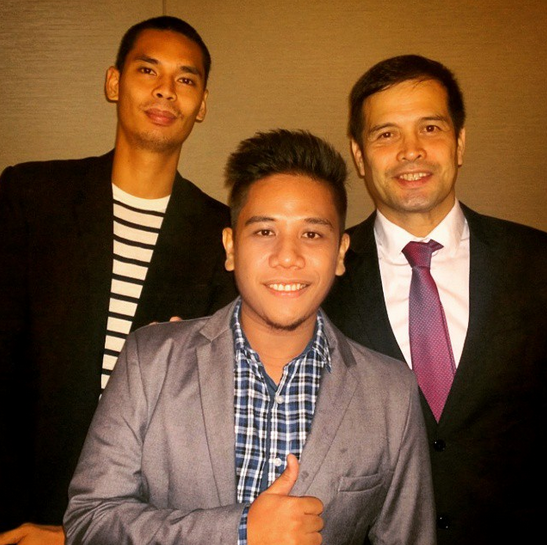 PBA Star Player, Mr. Japeth Aguilar (who's a fellow Atenean) and PBA Legend, Mr. Alvin Patrimonio who are both also endorsing the LG G4. 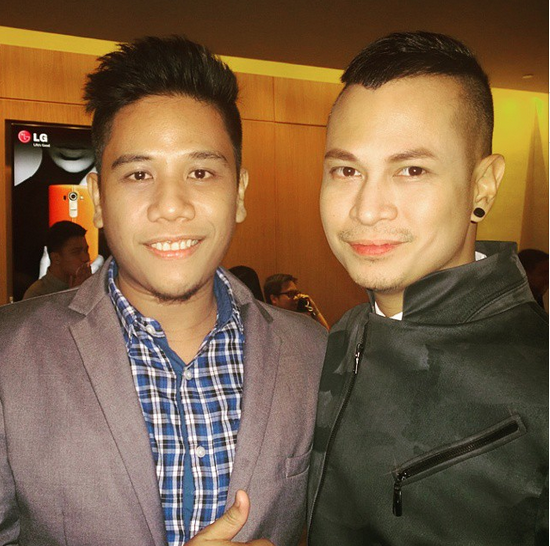 With the award-winning photographer, Mr. Niccolo Cosme, who presented a video during the event showing how the LG G4 enables users to be great by sharing their skills with others. 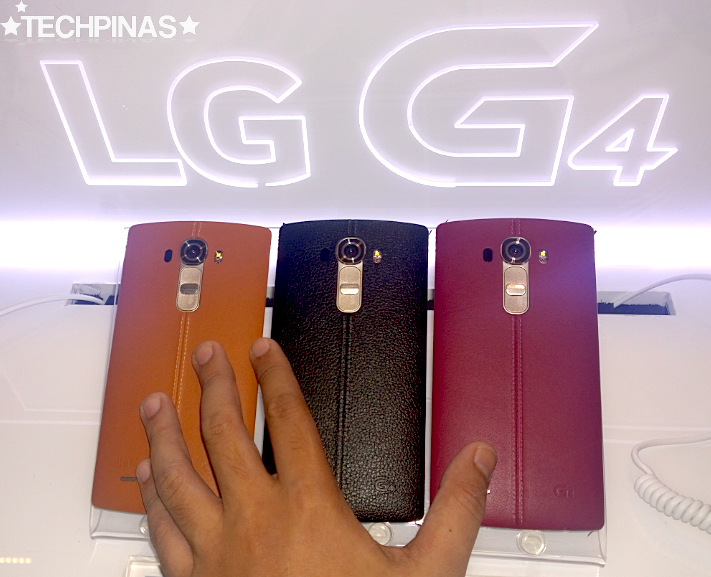 LG G4 will be available at all LG Concept Stores and authorized retail partners nationwide starting this June 2015. All genuine leather back models will sell for Php 32,990 while those with polycarbonate back cover will go for only Php 31,990. 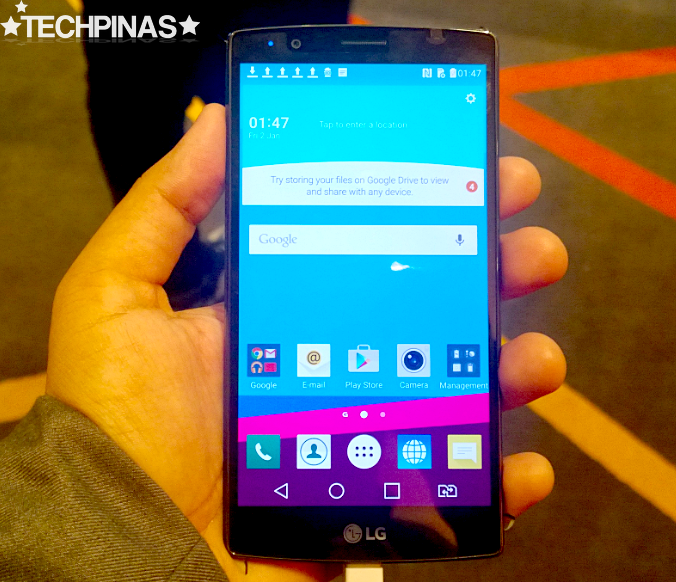 Note that all official LG G4 variants that will be launched in the country have Dual SIM capability.